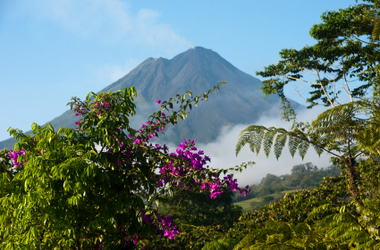 Kristen shares her summer study abroad experience in Costa Rica. I'm sitting in a computer lab, discreetly listening to two locals joke and tease one another in Spanish while it pours rain outside. If this were any other summer, I might be waiting in line for a ride at Whitewater or curled up on the recliner with my puppy, but it's not just any summer. This is the summer I study abroad with UGA's Costa Rica Maymester, and I have a strong suspicion that this will also be the best summer of my life. I didn't always want to study abroad in San Luis. It did fall into place neatly, though, which I think is the most important thing to remember when deciding where or when to study abroad: is the timing right? The program duration wasn't too long, since a whole semester probably would've overwhelmed me as someone who hasn't spent more than three weeks without seeing her family. The courses that were offered lined up perfectly for my majors (and minor): creative writing and advanced Spanish. It wasn't too expensive, wasn't in a country whose food or climate I would dislike, and wasn't going to interfere with any big events back home (like my younger sister graduating from high school next year). To make sure it was right for me, I also talked to people who had gone through the program before, and they had nothing but fantastic reviews and sincere wishes that they could relive their time here. You'll inevitably have a lot of questions when you decide to emerge yourself in a new culture, and these people who've already been there, done that, are essential to feeling prepared before you leave and knowing which things should be at the top of your to-do list. The next step was to convince my parents. My dad was excited for me from the beginning; he always said I needed to get out and see the world and gain more appreciation for all that we have here in America. My mom was the challenge, because all she could think of was Natalee Holloway or the movie Taken where wide-eyed girls like me end up in dangerous situations. I caught a break when I found out a girl in my sorority was going, too, and it turned out to be good not only for my mom's conscience but also for my own confidence. I felt better knowing at least one other person on the trip; however, there are plenty of people here who knew no one when they arrived on new ground. Don't limit yourself if you don't know anyone in the orientation or the initial meetings - you're going to a foreign country, so you shouldn't expect to know anyone anyway! Get more advice on studying abroad now. The most surprising part of my study abroad experience so far is how quickly we became friends and how thoroughly we can depend on one another. Standing in a forest in the pitch black darkness of night and holding a blue morpho butterfly between your thumb and forefinger is an incredible moment in itself, but sharing that with four other girls is even better. Taking a completely Spanish tour of the Monterverde Cloud Forest is exciting alone, but more fun when there are other people to make jokes in a foreign language and take pictures of you on the rickety sky bridge or posing with flowers that resemble two lips poised for kissing. It's true that the first days were really hard. Homesickness hits you in ways you could never have predicted; you get exhausted by mid-afternoon (or maybe that's from being 1300 meters in elevation), too many things remind you of home, and no matter what fun things you have planned for that day, it's hard to make yourself get out of bed. But you're not alone, and you're not permanently stuck in that awful mood. For most of us, the next day was the exact thing we needed: lots of sunshine, busy plans, and the realization that we were all feeling icky yesterday, so today had to be better. Now, each day seems to fly by, and every experience makes me love Costa Rica a little more. From day hikes to planting trees to watching Spanish movies, there's less and less time to miss home and more reason to enjoy every minute of being in a place with so many rare, endemic species and so much local color - literally, the hues of the toucans, quetzals, and three-wattled bellbirds, and figuratively, the fascinating culture. The most important lesson I've learned here: never underestimate the power of keeping a journal. I actually keep two - one English, one Spanish - and even just reading the first entry a few days later makes me nostalgic for that initial novelty. It's so much fun to look back on the little things and be in that time and space again; details make the story, and it's harder to remember what I ate for breakfast or what our tour guide's name was if I don't journal every day. Whether it's the best summer of my life, or the beginning of more summers filled with adventures like this one, I'm really happy, excited, inspired, in love, grateful, and ready to be here now, to learn and change, to live this life and none other. That's the lesson Costa Rica has to share with the world, and they won't let you forget it, since it is the national saying. ¡Pura vida! If you could study abroad for the summer, where would you go?